What is the service’s timetable? 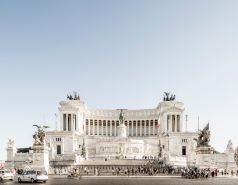 The first Roma City Tour buses begin their routes at 08:30 a.m. from Monday to Friday from Termini Stazione. You can find out more on the approximate times the first and last buses pass by different points on the information panels located at the bus stops. The last complete run starts at 05:45 p.m. in Termini Station and the service ends at 7:30pm. How long does the route take? The route takes around 1h 45 min. How frequent is the bus service? 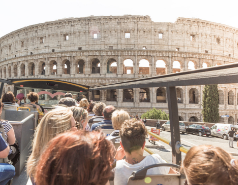 Roma City Tour has a large fleet of buses that allows it to offer a service frequency of every 15 to 20 minutes. Is there anyone on board who can provide information on the service? Yes, on all our buses there is a member of staff who can provide information in different languages and who will try to answer all your doubts about the Roma City Tour and recommend points of interest in the city and its surroundings. He or she can be found next to the stairs to the top deck and is also responsible for receiving passengers and checking their tickets. Where can I take the buses? You can board the bus at any of our stops. If you don’t already have a ticket, you can buy one on board. Where does the route begin? The main stop for the route is on Termini Stazione. However, you can catch the bus at any of the stops. Can I go and come back on the same bus? The Roma City Tour route is circular, so you can return to the stop you began at or to any other stop at any time. How can I find the information about the service disruptions? We inform about the service disruptions, we recommend you visit the website the specific day you are going to use the service. What are the buses like? All our buses are pink in colour, double decker and feature an open-top upper deck. You enter all of them at the front and exit from the rear, except for wheelchair users, who enter via the rear door. Do the buses feature an audio guide? Yes, all our buses feature an automatic audio guide system in 13 languages: Italian, English, French, Spanish, Portuguese, German, Dutch, Russian, Arabian, Chinese, Japanese, Korean and Hindi. Once you connect the headphones to the bus’s system all you have to do is choose the channel for the language of your choice. Are the buses covered or do they have a roof? Our buses feature a sliding roof that is used only in the case of rain. If you wish, you can also travel on the air-conditioned/heated lower deck, bearing in mind that you must always sit in one of the available seats, for your own safety. Is there room for wheelchairs? All Roma City Tour buses feature an access ramp and room for wheelchairs. Each bus has a maximum capacity of 1 wheelchair. Tickets can be purchased on any of our buses, at our different points of sale and via our website and our app. If you make the purchase on the website or on the app all you have to do is go to a stop and show the document you receive by email, printed or through your smart phone. Is the ticket valid for one day or for 24 hours? Roma City Tour offers you tickets valid for consecutive days and for periods of 24h or 48h. Depending on your election and the coincidence with the official schedules of the service. Are there discounts for groups? We have special prices for large groups. For further details, contact us by email or telephone (details in our contact section). Are your buses available for private hire? Yes, we have special rates for private hire and we can also personalise the service offered. For further details, contact us by email or telephone (details in our contact section). From what age do children have to pay? Children aged up to and including 5 years of age travel free of charge. Between the ages of 6 and 12, inclusive, they pay the child rate and from 13 and up they are regarded as adults. You can check our prices on our website or on our mobile app, available free of charge from the iTunes and Google Play stores. Until when can I use my ticket? The 1-day tickets are valid for a single day, until the end of service on the purchase date. The 24 and 48-hour ticket will show you the validaty in hours and will be valid from the moment you board into the bus. We also offer a ticket valid for a single run. Should I print out the ticket(s) I bought online? It is not necessary. You can present the voucher on paper or show it through your mobile phone when you first board the bus, where it will be exchanged for a ticket and you will be provided with all the associated material. Can I bring luggage on board? Our buses have no luggage storage. So, if you have luggage, it can only consist of small suitcases you can take with you and that do not take up any other seat, aisle space or emergency exits. We regret to say that large suitcases or packages are not allowed on board. Can I bring a baby buggy on board? Yes, but it must remain on the ground floor, folded if possible. It will be placed in the area set aside for wheelchairs, so disabled people shall have preference, meaning that you must remove the buggy if required. Do I have to bring my own headphones? There’s no need. However, if you wish, you can bring your own headphones to connect to the bus’s system via its 3.5 mm mini-jack connector. Are there any specific safety rules for on-board travel? 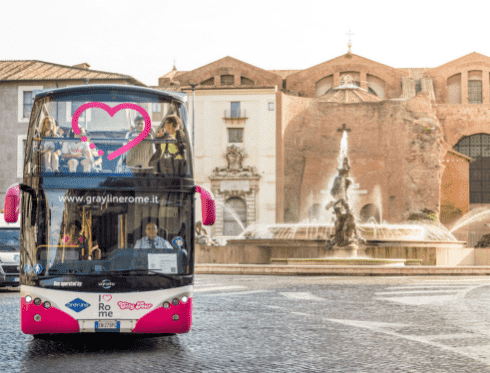 Given that the Roma City Tour is a service offered aboard moving buses, it is extremely important that you carefully follow all the safety rules indicated by our on-board staff and by the audio guide system. While travelling, you must not stand, eat, drink, smoke, have open umbrellas on the top deck or throw or extend any object out of the bus. With the exception of guide dogs, no animals or pets of any kind are permitted on board Roma City Tour buses. Do I enjoy priority boarding on the bus if I’ve already purchased my ticket? No. Everyone must wait in line to board at each of the stops, whether or not they already have a ticket. Can I smoke on the bus? No. Smoking is strictly prohibited aboard our buses. Does the Roma City Tour have a mobile app? Yes, we offer a free app for iOS and Android devices, which allows you to enjoy your trip by identifying in where you are, where you are heading and which points of interest you can visit, via its completely up-to-date multimedia content. You can download the Roma City Tour App from the iTunes and Google Play stores. I’ve lost my ticket. What can I do? Unfortunately, you can only board the bus with a valid ticket, and its loss or theft does not give rise to any entitlement to replacement or refund. Not other forms of payment receipt or reused vouchers are accepted. Once you have acquired your ticket, you must keep it, as you must be able to show it both when boarding the bus and during routine checks. It is the customer’s responsibility to prove that he or she has been supplied with a ticket and, if this has not happened, to ask for one from our on-board staff when making the purchase. Do you have a lost property office? Yes, please go to our customer service office, located in Via Vittorio Emanuele Orlando N.95 Roma 00185, tel +39 06 474 2501 in front of Mascagni Hotel. You can also contact us by email at customers-rom@city-tour.com. Where can I send a complaint about the service? If you are unsatisfied with our service, you can contact us via email at customers-rom@city-tour.com. Please provide all possible information to us so we can study your case and respond as soon as possible. I have made a purchase on the webpage/app but I am not sure if it has been processed correctly. How can I know it? If the transaction has been processed correctly, you will receive a confirmation via email. 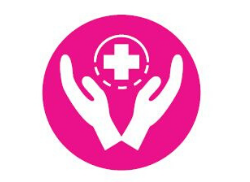 Anyway, if you have coverage problems, do not make the purchase more than once until you receive the confirmation. I have made a purchase on the webpage/app but I have not received the voucher. What do I have to do? If you make a purchase and do not receive any email with the vouchers attached, please, contact us in customers-rom@city-tour.com and we will send them to you.